Webistan Photo Agency » Blog Archive » Take part in “My Vision” photo contest ! Take part in “My Vision” photo contest ! Since 1979 I have tried to create a form of complicity between my camera and the people I photograph, who are willing to let us look inside their soul through their eyes. Today, their pictures are exhibited in several cities around the world as part of the Fenêtres de l’âme (Windows to the soul) and Chants de café (Soul of Coffee) exhibitions. With this contest, I invite you to submit photos of those exhibitions and share your own vision of the stories told by those pictures. 3) Or send your pictures to photo@webistan.com , indicating your first and last names on each file. JPEG/JPG files of 2 Mb max each. 4) A maximum of 10 photos by participant. 5) The deadline to enter is November 3rd 2013. ● 1st Prize: a meeting with Reza to discuss photography + a signed book + a One world one tribe DVD. ● 2nd Prize: 4 signed books + One world one tribe DVD. ● 3rd Prize: 2 signed books. Invite your friends to like your pictures on social networks. The author of the most « liked » photo will win: a meeting with Reza + a signed book + a One world one tribe DVD. Net surfers will vote for the pictures sent via email on the website: Rezaphoto.org. The author of the best graded photo will win: a meeting with Reza + a signed book + a One world one tribe DVD. The winning photographs will be shown on social networks & Reza’s websites and will benefit from an international communication campaign. 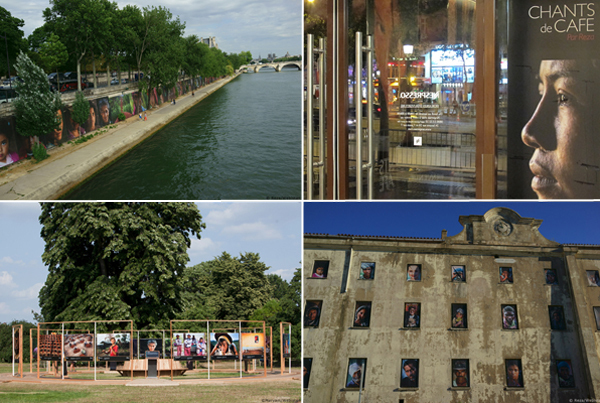 ● PARIS : banks of the Seine, Quai des Tuileries/Quai Anatole France, opposite the Orsay museum, until September 30, 2013. ● LONDON : Kew Royal Botanical Gardens, until November 3rd, 2013. ● NESPRESSO BOUTIQUES worldwide until August 31st, 2013. ● BONIFACIO / Rencontres: city walls and walls of the Caserne génoise, Montlaur site, Haute-Ville 20169 Bonifacio. ● CORTE/ Résistances : gardens and walls of the Musée de la Corse, La Citadelle 20250 Corte. ● BASTIA / Insouciances : Bastia museum, place du Donjon, 20200 Bastia.